Since autumn 2014 customers can exercise their handling and knowledge of SCHOTTEL propulsion systems in the SCHOTTEL Academy by using a training simulator. 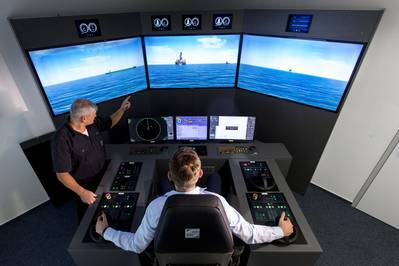 Academy participants are seated as if on the bridge of a real vessel and learn how to deal safely with the different SCHOTTEL propulsion systems, control levers, operator panels and displays. Again and again, crews are faced with situations where a fast response is essential – both during their normal work and even more so in emergencies, such as sudden evasive manoeuvres or system failures. The correct response in difficult situations must be learnt in such a way as to allow instant recall. Simulators have a decisive role to play in learning the correct sequence of measures to be taken – for greater safety and efficiency. The simulator has been specially tailored to the requirements of SCHOTTEL customers by SCHOTTEL instructors and employees of the manufacturer Transas, and the training personnel have received corresponding qualifications. The training programme currently covers a wide range of different propulsion unit sizes with various configurations in a current total of ten different vessels, with examples including ferries with two units in both the bow and the stern, tugs with two units in the stern and an STT in the bow, and offshore vessels with two units in the stern, an STT in the bow and a retractable unit in the bow. Six ports and waterways are stored in the system, including St. Petersburg, the Bay of Kiel and the Suez Canal. For many years now, the German propulsion specialist has placed great emphasis on good training for master mariners, crews and service personnel, either at company headquarters in Spay or on site at the customer’s location. Well-trained SCHOTTEL instructors impart their knowledge to participants, covering every aspect of the operation and maintenance of SCHOTTEL propulsion systems. A state-of-the-art training centre was built for this purpose in 2010. Steadily increasing numbers of participants are evidence that the SCHOTTEL Academy enjoys a high level of acceptance.